"When I want to remember something, I give it and give it and give it away until it's mine." Dr. Howard R. Driggs wrote or edited more than 50 books, including at least seven novels, during his life, and he received many honors and awards for his work as an educator and historian. Among the historical fiction novels Driggs wrote were Ben the Wagon Boy based on the story of his father, Benjamin Driggs. He also wrote George, the Handcart Pioneer. During his distinguished career, Dr. Driggs was both a professor of English education and historian of the American West. He was well known throughout the country as an author and speaker in both fields. He graduated from the Brigham Young Academy high school in 1892 with a Normal Certificate, which qualified him to teach in the secondary schools. His parents, Benjamin Woodbury Driggs and Rosalia Cox Driggs, were among the early Mormon pioneers who crossed the plains to Utah as children. Howard was born in Pleasant Grove, Utah, on August 8, 1873, and during his childhood heard many exciting firsthand stories of dramatic pioneer experiences from his parents, grandparents and their friends. As a young boy Driggs loved to learn and he particularly loved American history. Even before he could "officially" attend school, he visited his brother Frank's fourth grade class. To his teacher's and mother's surprise, when Frank was called upon to recite a poem in front of the class and hesitated, Howard stepped forward and recited the 40 stirring lines of the poem "Liberty Bell." A few years later, he worked for a home builder and caught adobe bricks for 11 days, earning 25 cents a day. With this money Howard decided to purchase an American history book. When he finally found the one he liked, the store owner told young Howard that the price was five dollars. Though disappointed that he didn't have the all the money needed, he asked the owner, "You know my father, don't you? ... Could you trust him for the balance?" "Howard, I can trust you," said the store owner. Driggs retold this story in a book he wrote, When Grandfather Was a Boy. The history book purchased with his hard-earned $2.75 down payment, One Hundred Years of American Independence, published in 1876, is found in the Driggs Collection at the Sherratt Library, Southern Utah University in Cedar City. On its inside cover page is a brief handwritten account of that purchase by Howard R. Driggs. Education and history, the two fields to which Driggs devoted his career, were intense interests that he developed at an early age. He was motivated to learn stories from others about the history of the country and find a way to share them. He and some of his young friends enjoyed staging outdoor reenactments of historical events in their hometown. While his family was living in West Jordan, Utah, Driggs attended his first school, the "Big Blue Schoolhouse" where William M. Stewart was one of his teachers. 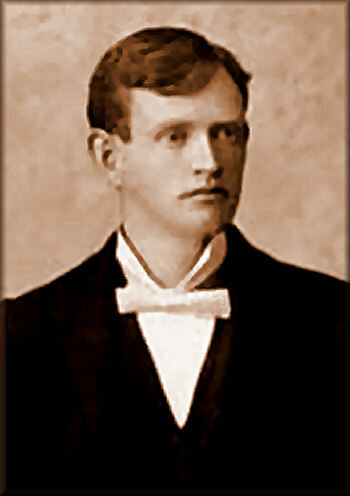 Howard Driggs later attended Brigham Young Academy in Provo, Utah, at the age of 17. The fall of 1891 was the last time that classes was held in the Z.C.M.I. warehouse. Driggs participated with great joy in the march from the old Z.C.M.I. building, up Academy Avenue to the new Education Building on 5th North in January of 1892. The march included a parade band, the Grand Old Flag in front of an organized group waving flags and singing. Marchers included the Board of Trustees, the faculty, the high school students, elementary grades including kindergarten, and townspeople in buggies, surreys and wagons. An unforgettable dedication followed in a large, high-ceiling ballroom, crowded to the window sills, with people standing in the adjacent halls. It marked a new beginning. It was while he was at Brigham Young Academy that he decided to become a teacher by following the sterling example of the legendary principal and founder of the Academy, Karl G. Maeser. Howard R. Driggs as a young man. After his 1892 graduation from BYA with a teacher's diploma, Howard taught in the public schools in Pleasant Grove in the early 1890s. There he was inspired by the leadership of David H. Christensen, one of Utah's finest school superintendents. Driggs entered the University of Utah, then a two-year institution, during the last year of the presidency of Dr. John R. Park. He graduated in the Class of 1897, which selected him as the Class Poet. David O. McKay, later President of the Church of Jesus Christ of Latter-day Saints, was the Class President. After Driggs graduated from the University of Utah, he married Eva May Frampton, a fellow school teacher from their mutual hometown of Pleasant Grove. 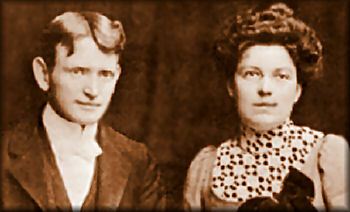 Wedding photograph of Howard and Eva Driggs. The new Driggs family moved to Cedar City, Utah, where he helped launch Brigham Young Academy's Beaver Branch Normal School, and there he served on its first faculty as an English instructor. The opportunity to go to Cedar City in 1897 to help start a new institution of learning was a great challenge for him, particularly in light of the short time frame in which the school had to be launched. During this time Eva continued her career as a teacher in the Cedar City schools. Howard and Eva spent the summer of 1898 in Chicago, where Howard studied at the University of Chicago. Howard and Eva later returned to Chicago in 1905 where Howard continued his studies for two years. Howard won first prize in an oratorical contest and went on to represent the University of Chicago in the 1906 annual contest of the Northern Oratorical League, delivering a speech entitled "The Inner Light of Americanism." Driggs earned a Bachelor of Arts degree in 1908, and a Master of Arts degree in 1918, both at the University of Utah. Upon their return to Utah, Howard became Supervisor of English in the State Normal School at the University of Utah, and later the Principal of the Secondary Training School, which was similar to Brigham Young University High School in Provo. In 1914, upon the recommendation of Dean Milton Bennion, he was promoted to Professor of English Education. During these years he was active in other professional activities, including serving as President of the Utah Library and Gymnasium Commission, 1908-11; President of the Utah Education Association, 1916; and Editor of the Utah Educational Review, 1917-18. He also served as Vice President of the National Education Association in 1919. His leadership of the Utah Library and Gymnasium Commission arose out of a strong belief in the importance of providing worthwhile reading materials for students and encouraging them to enjoy reading. Driggs told one interviewer that he felt it was not enough to teach pupils how to read well; it was also necessary to provide worthwhile reading material and cultivate in them a lasting love for good books. His efforts were supported by parents and teachers in communities throughout the state, and within a few years nearly one hundred public libraries, all supported by tax funding, were established in Utah. In 1913 he also began to write a series of highly useful textbooks for English teachers, Live Language Lessons. The books were widely adopted and resulted in Driggs receiving many invitations to speak throughout the country. He adapted the research for his master's degree into a later series of books, Our Living Language. In 1918, Driggs took a leave of absence from the University of Utah to study English teaching throughout the country. He went on extensive trips during which gathered material written by thousands of students at all grade levels. He also addressed teacher groups, and gave demonstration classes. His study and travel continued until 1923 when he joined the faculty of the New York University School of Education. The materials gathered during this period were utilized in the preparation of his doctoral thesis at NYU, where he was Professor and Chairman of the English Department from 1927 until his retirement in 1942. In 1926 he received a Doctor of Philosophy degree in Education from New York University. During these years Driggs also pursued his lifelong passion of finding and preserving firsthand stories of pioneers. In the 1920s, Driggs was frequently invited to appear on radio stations in New York to make presentations on Western history and the trail riders he had known. He received many appreciative letters from listeners. His brother Burton, who lived in North Dakota, wrote to describe how exciting it was to be able to hear his brother's voice in his living room. These were the early days of radio, and it is not difficult to imagine the excitement generated by the ability of listeners to feel connected to speakers in distant places. Burton's letter was a touching expression of the excitement that many people felt. 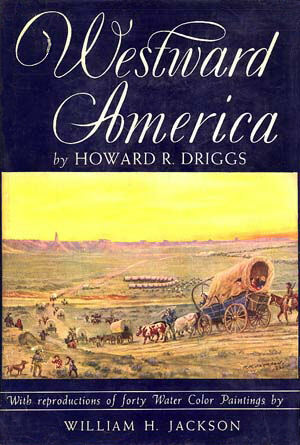 In the 1920s and 1930s Driggs was a co-author and editor of a number of books in the Pioneer Life Series published by World Book Company. One of these books was Ox-Team Days on the Oregon Trail on which he collaborated with Ezra Meeker, a well-known Oregon Trail pioneer. Meeker later formed the Oregon Trail Memorial Association and served as its first president. Howard Driggs and Dr. George W. Middleton, a fellow Utahn, were among the charter members of the association. 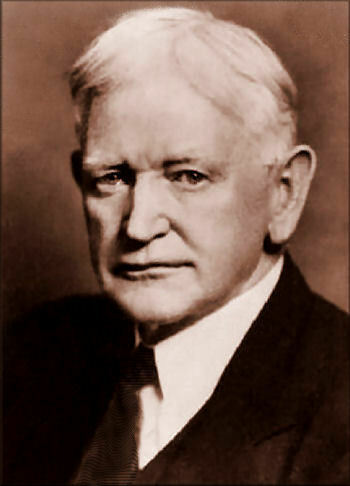 Driggs became the President of the Oregon Trail Memorial Association in 1928. This organization later became the American Pioneer Trails Association which he headed until his death in 1963. Throughout his life, Driggs was active in the Church of Jesus Christ of Latter-day Saints. He wrote extensively for Church publications, and helped to organize and lead many Church projects and events. He was heavily involved with the Church's Sunday School, serving as a member of the organization's general board from 1910 to 1930. He was also involved in starting the first LDS Church sunday schools in New York City and Washington, D.C. While living in New York City, Driggs served as a Branch President, and when the New York Stake was organized in 1934, Driggs served as a member of the Stake High Council. In 1930 the American Pioneer Trails Association, with Dr. Driggs as President, sponsored the "Covered Wagon Centennial" -- a nationwide celebration of the Oregon Trail -- which coincided with the 100th anniversary of the birth of Ezra Meeker. President Herbert Hoover participated and issued a Presidential Proclamation of the Centennial, the original of which is now among the items preserved in the Howard R. Driggs Collection at SUSU in Cedar City. One of the highlights of that year was a large celebration at Independence Rock, Wyoming, which drew nationwide attention to the activities of the Association. Over 10,000 people attended the event, including Boy Scout troops from all over the country. A large delegation from Utah was headed by George Albert Smith and included LDS Church President Heber J. Grant. The event inspired many celebrations throughout the country, and the Association was credited with promoting national awareness of the historical heritage associated with other pioneer trails as well. In 1935, the Oregon Trail Memorial Association organized a re-run of the Pony Express Trail, the 75th anniversary of the trail. The association arranged for Boy Scouts to carry mail by horse from Sacramento, California to St. Joseph, Missouri. From there it was flown to Washington, culminating in a ceremony on the White House lawn, in which Dr. Driggs participated, where the mail was presented to President Franklin D. Roosevelt. One particular book in the Pioneer Life Series was The Pioneer Photographer by William Henry Jackson, who was renowned as one of the original photographers of the West. Jackson was a member of the Hayden Expedition in the 1870s, organized by the United States Department of the Interior. Dr. Driggs collaborated with Jackson in the preparation of the book. This began a close friendship and association between the two which lasted until Jackson's death in 1942 at the age of 99. 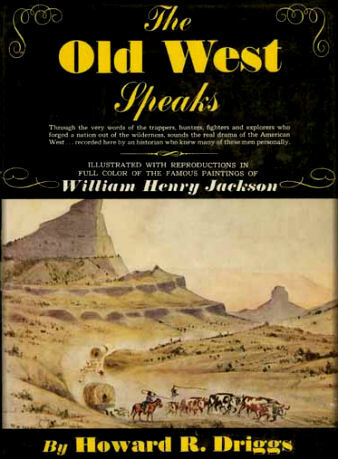 William Henry Jackson served as the Research Secretary of the Oregon Trail Memorial Association, and made many paintings of pioneer scenes used in some of the books written by Dr. Driggs. These illustrated books included The Pony Express Goes Through, Westward America and The Old West Speaks. These titles are just three among more than 50 books that Driggs wrote during his lifetime. When he retired from New York University in 1943, he was named Professor Emeritus. After retirement he continued to serve as President of the American Pioneer Trails Association, wrote many books and articles, spoke throughout the country and remained active in the LDS Church. Driggs served as President of the Horace Mann League in 1946-47. He continued to lead summer treks throughout the West for the American Pioneer Trails Association, both organizing events for members and participating in local celebrations organized by others to commemorate the pioneer heritage. Driggs was also interested in other aspects of American history and through the American Pioneer Trails Association he organized a ceremony at the Green-Wood Cemetery in Brooklyn, New York in 1956 to mark the grave of Samuel Chester Reid (1783-1861), the designer of the American flag in its then �present form. Reid's grave was unmarked for 95 years until this ceremony, at which the Secretary of the Navy dedicated the monument. In the 1950s Driggs also wrote "New Light on Old Glory" -- a pamphlet -- describing the origin of the American flag, accompanied by a 78-rpm recording with the same name. These materials were adopted for use at Fort McHenry, Maryland. They were also adopted for use in the New York City schools to teach the story of the origin of the American flag. Howard and Eva Driggs had two sons, Howard Wayne, born in 1902, and Harold Perry, born in 1907. Eva Driggs died in 1947, shortly after the couple's 50th wedding anniversary. Wayne graduated from the University of Utah, received his doctorate from New York University, and had a distinguished career in the field of education in Utah and the East. He was Director (President) of the Branch Agricultural College from 1945 until his death in 1951. Perry also graduated from the University of Utah and spent most of his career as an advertising executive with the J. Walter Thompson Company in Chicago. 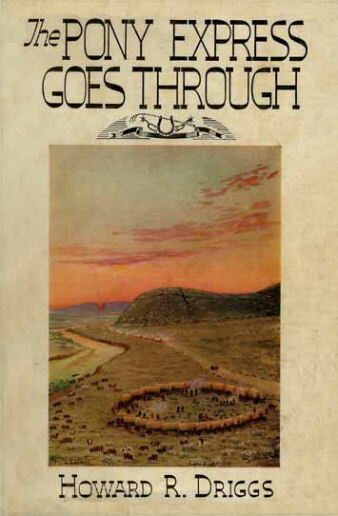 Prior to his career in advertising he worked with his father in the Oregon Trail Memorial Association and illustrated some of his father's books. He served as President of the college in Cedar City which became known as Southern Utah University. He lived in Salt Lake City at the time of his death in 2003. In 1948, Dr. Howard Driggs married Margaret Brazier Quarrier in Lawrence, Kansas. Prior to their marriage, Margaret had been a newspaper reporter and public relations director for a non-profit organization in Kansas City. She had also been an officer of the Kansas City chapter of the American Pioneer Trails Association. After their marriage, Margaret assisted him with the activities of the Association and with the editing of his books. She had three children from her prior marriage who were devoted to their stepfather and appreciated the strong influence he had upon their lives. In 1953 Margaret accompanied Dr. Driggs to a meeting at the White House at which he presented a collection of his books to President Dwight Eisenhower. The meeting had been arranged by Utah Senator Wallace Bennett, who knew of the President's interest in Western history and who attended the presentation. In subsequent correspondence with Dr. Driggs, President Eisenhower expressed his strong interest in the subject matter of the books and his warm appreciation for the collection. Dr. Driggs' death in 1963 ended a remarkable career. His legacy is preserved in the Howard R. Driggs Collection archived at the Gerald R. Sherratt Library at Southern Utah University in Cedar City. The extensive collection includes his papers, correspondence, diaries, honors, awards, photographs, memorabilia and poetry. It also includes records of the Oregon Trail Memorial Association and the American Pioneer Trails Association, and a wealth of historical information and artifacts valuable to researchers. The collection reveals the breadth of Dr. Driggs' life's work, the high regard in which he was held by others and the wide recognition he received at the time of his death. It illuminates the central themes of his life: inspiring teachers and students, preserving history, and devotion to his family and church. It contains many items reflecting the remarkable number of people whose lives he touched and who were inspired and influenced by him. In 1965, two years after his death, the Granite School District in Salt Lake City honored him by naming a new school after him - the Howard R. Driggs Elementary School. A bronze bust created by Avard Fairbanks is displayed in the entrance lobby of the school. In 1999, Southern Utah University honored Dr. Driggs at its Founders Day Ceremony. A portrait of him was unveiled, which was displayed in the Great Hall. Family members who attended the ceremony included Margaret Driggs, Perry and Clara Driggs, and Beth Swensen Driggs, the widow of Wayne Driggs. Margaret lived in Denver Colorado. Clara died in 2001 and Beth died in 2002. Prior to his death, Perry Driggs established two scholarship funds at the Southern Utah University - the Eva and Howard R. Driggs Fund in honor of his parents, and the Clara and H. Perry Driggs Fund in honor of his late wife and himself. He was inducted into the Old Main Society in 2002. Perry and Clara had two sons, Perry Jr. of Bloomfield Hills, Michigan and Paul of Salt Lake City. Wayne and Beth Driggs had five children, three of whom survived: Arthur of Lake Ariel, Pennsylvania, Ralph of Bountiful, Utah and Susan Driggs Staker of Englewood, Colorado. Dr. Driggs was a master teacher. On one visit to a son's home, a grandson who was busy studying for high school exams asked him for help to get a better understanding of the subjects. He was curious how Grandfather Driggs could remember and recall so many facts and pieces of literature he had studied so long ago, and that the grandson was just recently studying in high school and attempting to recall. His grandfather explained, "When I want to remember something, I give it and give it and give it away until it's mine." That thought on giving and learning is why Dr. Driggs found teaching so rewarding because it expands both the "giver" and the "receiver." A Howard R. Driggs Memorial Foundation has been established to help preserve his legacy for future generations.